Unwind from the demands doing, and relearn the art of being. Restorative Yoga postures follow the trajectory of the nervous system, allowing us to gently shift from the sympathetic (our fight, flight, or freeze response) towards the parasympathetic (our rest & digest state). The use of props fully support, cradle, and nurture to help release any mental, emotional, or physiological holding. It is in this space of neural pathway rewiring that the body’s own healing can occur. The art of Reiki, an ancient healing modality using the energy from the Universe which resides inside us all, can allow us to drop into an even deeper state of relaxation. Reiki is practiced using either a light hands-on or non-pervasive approach, with the intention for the highest good. The energy that flows from practitioner to client knows where it’s needed, and how much is needed, to facilitate healing. People often report the effects as a sense of deep relaxation, release, and sometimes epiphanies. However, these experiences are as as unique as the individual. 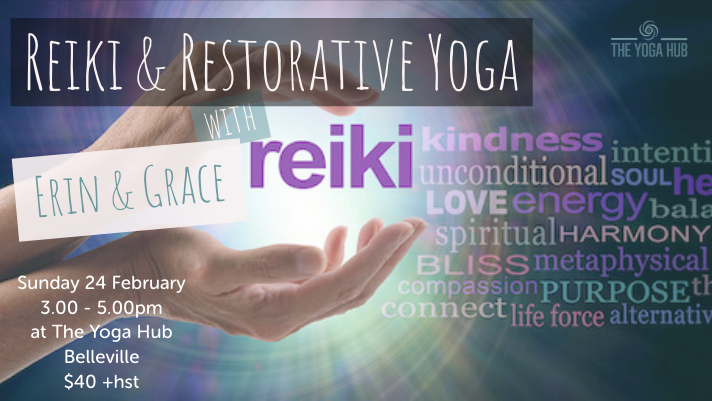 Join Erin and Grace for this two-hour meditative session as we use gentle postures, music, and Reiki as our guides along the journey from adrenaline-junkies to blissed-out bohemians. This workshop is suitable for all levels, all welcome.